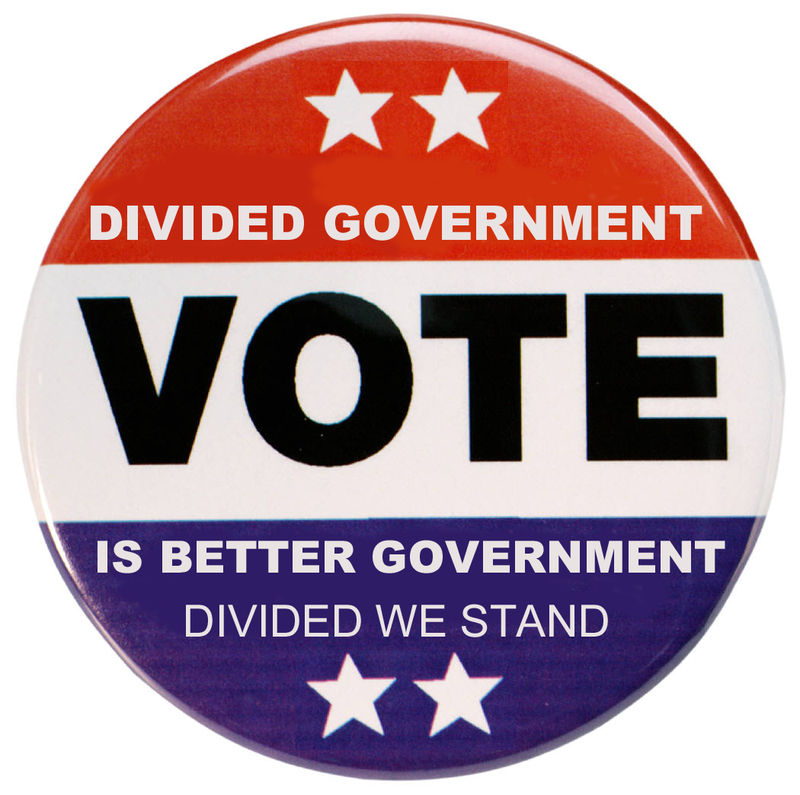 The Dividist Papers: Thesis: Divided Government is Better Government A Lot Better. Really. The thesis for this blog is based on a simple documented fact, that our federal government works better and is more fiscally responsible when executive and legislative power is split between the parties.
" The rate of growth of real (inflation-adjusted) federal spending is usually lower with divided government. The table below presents the annual percentage increase in real federal spending by administration, in each case with the percentage increase in the first year of a new administration attributed to fiscal decisions made in the prior administration." "The only two long periods of fiscal restraint were the Eisenhower administration and the Clinton administration, during both of which the opposition party controlled Congress. Conversely, the only long period of unusual fiscal expansion was the Kennedy/Johnson administration, which brought us both the Great Society and the Vietnam War with the support of the same party in Congress. The annual increase in real federal spending during the current Bush administration, by the way, has been 4.4 percent -- not a happy state of affairs, given the war and a renewed majority of the president's party in both chambers of Congress." "When looking at three measure of economic well-being during the gridlock and non-gridlock years, without exception, the record is superior in the years of gridlock. The median unemployment rate was almost 15 percent lower in the years of split control than in the years when one party (in this case, the Democrats) had complete control. The stock market in the typical year rose nearly three times faster than when power was divided. Even inflation, nominally controlled by the supposedly independent Federal Reserve System, was lower in a typical gridlock year." SOURCE: U.S. Bureau of Labor Statistics, Council of Economic Advisers, author's calculations. These are not new articles and this is not breaking news. But, as an analysis of historical fact, their conclusions are as fresh and relevant today as when they were written. Certainly nothing has transpired in the single party, undivided, non-gridlock, no veto, no fillibuster government of the last six years that would counter the conclusions in these articles. In that time we have seen nothing but increasing federal spending, creation of new bureaucracies, breathtaking record deficits, and government growth that rivals LBJ's Great Society. Facts are Facts. Truth is Truth. At some point, if you value the objectives of limited government and fiscal responsibility over party loyalty, you must stop listening to what politicians say and vote based on what they do. The logical vote, to meet these objectives, is a vote for divided government. In 2006, that means voting Democratic. If the Democrats take Congress and look like they will maintain control in 2008, it also means voting Republican for President in 2008. You can still support voting for Republican candidates in the mid-term 2006 election, you just cannot pretend that you are supporting anything except increasing government spending, increasing the size of the federal government, and increasing the federal deficit during the last two years of this administration if you do. If you pull that Republican lever in November, I hope you will look in the mirror and say "I am asking for increasing government spending, increasing the power of the Federal government, and increasing the Federal deficit." I can assure you, if we continue with single party control of the federal government, you will get exactly what you are asking for. Can this knowledge of how our federal government behaves be parlayed into a voting strategy and a voting block? Can a small voting block shift the balance back to more fiscally responsible government, to better government, to divided government? I agree with the principle here, in fact, I've voted to divide power for years - I grew up in L.A. where you vote for everything from head librarian to dog-catcher, and I almost always voted a mixed ticket. And I'm with you on the 2006/2008 voting choices. I do have a few questions: What do you do in situations where all three bodies (house, senate, and presidency) are essentially "up for grabs" in that the odds are too close to call? 2) For your small voting bloc to work, don't you have to have a a default position that in any situation where everything is up for grabs, you vote one particular way, e.g., republican for president, and democratic for Congress? 1) I think you have to make some assumptions. One reasonable assumption is that incumbents win. They have such crushing advantage, that I think you have to make that assumption. Even this year, with the high negatives of the Bush administration, it'll be a close call on whether the Dems can take a majority in either house of congress. Example: If the Dems do take the House, and the Senate stays in the Reps hands in '06, then I'll assume they will retain their respective majorities in '08. 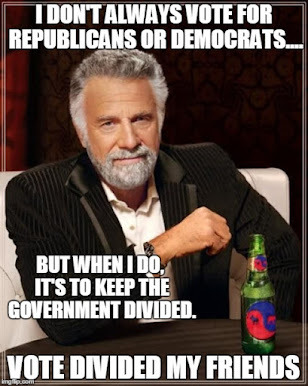 Under those circumstances, there is no "divided government" vote for President. Vote for the best man, or your partisan preference, or even 3rd party. As long as the Congress is split, it does not matter. 2) Yeah, I think you are right, but... Everything I have suggested in this blog is based on documented fact-based studies. The article cited here shows that you get better governance with legislative and executive branches split between the parties. The follow-up Niskanen paper to the article cited in this post shows that it is even better if majority control of Congress itself is split between the parties.My sense is that a "default" rule regarding Dem or Rep for president/congress, would require some supporting study to be credible, and innoculate the "divided government" voting strategy against charges of partisanship. Net net. To be credible, absent a supporting study, I think the default has to be this: If there is no obvious crystal clear "divided government" vote, then there is no "divided government" recommendation. 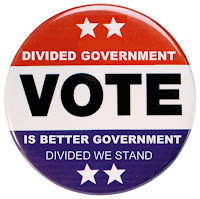 Every Federal election will not have an automatic "divided government" vote. While I agree that we spend less do to the division in congress. 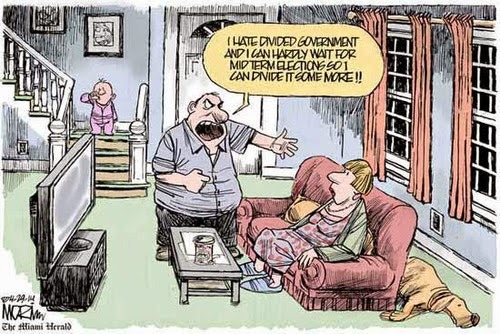 I vehemently disagree that a divided government is better government. On my blog I have posted about my beliefs on this topic.